This entry was posted in Ganeti on August 26, 2014 by helga. Thanks to all of you who attended my talk at Linuxtag 2014, in Berlin! This entry was posted in Ganeti on May 13, 2014 by helga. I’ll give a talk about Ganeti at the upcoming Linuxtag 2014 in Berlin! The plan is to give a short overview about Ganeti and an update on current development. I will be around on the conference from Thursday to Saturday. Feel free to approach me if you want to chat about Ganeti. This entry was posted in Ganeti on April 22, 2014 by helga. This entry was posted in Ganeti on October 3, 2013 by helga. 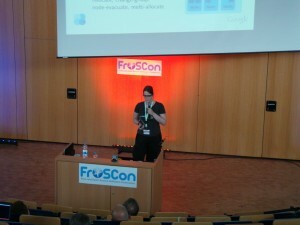 In August, me and my colleague Klaus Aehlig gave a talk about Ganeti at FrOSCon, a free and open source conference, in St. Augustin, Germany. If you watched our talk, please give us your feedback!